The school superintendent Claire Bugen was delighted by performance of the TSD high school students. 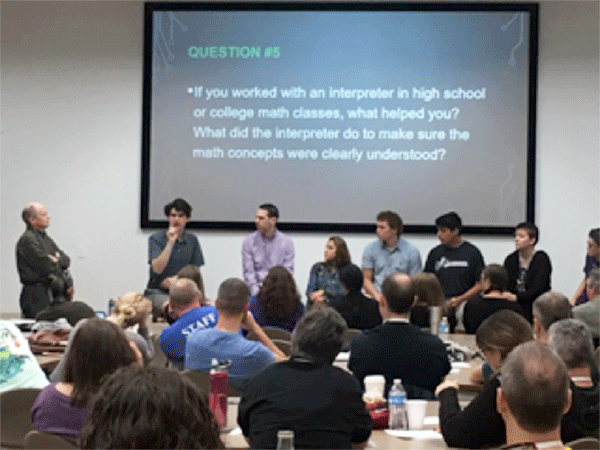 “Having five TSD high school students address an audience of professionals not only shows students excelling socially and academically, but is testimony to the quality of our educators. ABOUT THE TEXAS SCHOOL FOR THE DEAF: The Texas School for the Deaf (TSD) is the oldest continuous operating public school in Texas. Educating deaf and hard of hearing students of Texas since 1856, the campus also provides outreach and educational resources for students, their families and professionals in the field throughout the state of Texas. With educational excellence and a strong belief in a culture and community at TSD, students form a unique identity based on their individual strengths and talents. TSD is an environment where students learn, grow, and belong. For more information about the Texas School for the Deaf, visit www.tsd.state.tx.us. ABOUT DEAFTEC: DeafTEC is a National Science Foundation-funded Center of Excellence, one of approximately 40 Centers across the United States. DeafTEC is unique in the fact that its focus is on a particular audience, deaf and hard-of-hearing students, rather than on a technical discipline. DeafTEC is administered by faculty at the National Technical Institute for the Deaf (NTID), one of the nine colleges of the Rochester Institute of Technology (RIT), and overseen by a National Visiting Committee made up of professionals in academia and industry. Emphasizing career education, RIT is a privately endowed, coeducational university with one of the most accessible communities available for deaf and hard-of-hearing students. Over 1,300 deaf and hard-of-hearing students attend RIT and study, live, and socialize with more than 16,000 hearing students in what is widely regarded as the largest “mainstreamed” program in the world. Deaf and hard-of-hearing students at RIT can pursue associate degree programs in the college of NTID with courses taught using direct instruction or they can pursue bachelor degree programs in the other seven colleges of RIT using a wide range of educational access services.